STAR TRACE Unbalance Vibratory motors are Robust, Reliable, High Loadable, Quiet Running cautious on electric current consumption and require no maintenance.Vibration may be considered as a simple act but have a great impact. Those unaware of the influence of vibration will find interesting facts revealed which is sure to turn on good vibration in your business. STAR TRACE Unbalance Vibratory motors or Vibrating Motors are totally enclosed 3Phase, Squirrel cage induction vibrating motors with adjustable, eccentric weights mounted at both ends of the shaft, to set up vibrating motion during rotation. The design of shaft and the selection of bearings has been carefully done to withstand heavy radial loads. Suppliers who have used our vibratory motors have had trouble free working.As manufacturers and suppliers we have clients locally and globally. The vibration brought about by the motor helps in moving the feed forward at the same time the vibration also breaks down if there are lumps. Vibration also brings about more space in the existing container.Thus the influence of vibration is remarkable.The vibratory motor is a must have for all suppliers irrespective of what item the suppliers are handling. Operating torque range suitable for vibrating units : From 3.6 to 3600 Kgs. Working weight range : From 1 to 6000 Kgs. Power connection : From 3Phase current with 50 Hz 415V A.C. Rated consumption(electric current) : 0.1 to 10KW. IP 55as in DIN IEC 34, Part 5. Insulation class : F class. Rugged construction for tough vibrating environment. Cylindrical roller bearing. Prelubricated for long life as vibrating motion is continuous. Totally dust proof air cooled design. Can operate in dusty environments. Winding F-Class insulated vibrating motor. Impervious to dust, moisture & vibrations. Vibration or Vibrating force adjustable from zero to maximum by adjusting position of unbalance weights for vibrating intensity. Moderate usage of electric current. 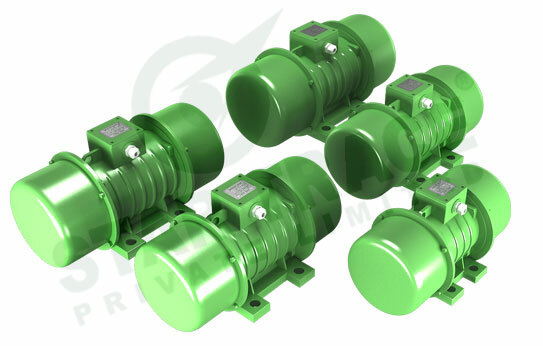 These unbalance vibratory motors running on electric current are used for its vibrationin various material handling equipment such as vibrating screens, vibrating conveyors and vibrating feeder. They are also used on hoppers for vibration, silos to prevent congestion of material flow. Foundry shake-outs or vibration and compacting machines use these vibration motors for fast and efficient operation as vibrating motion loosens the feed with each vibration. One of two lifting lugs. Quality-tested components, each motor tested under load. Reliable starting by means of a high-powdered starting torque. Permanent and well legible setting marketing of the unbalanced weights. Vibration-proof joining through the considerable Tensility of the mounting screws. Dust-tight and water-tight through a sealing covering with special circular rubber washer. Universal mounting facilities through an optimum choice of inter spacing in the base mounting. Embedded in high-quality impregnating resin vibration-proof winding, insensitivity to damp and dust. Generously dimensioned cylindrical roller bearing, self lubricating maintenance-free, long life expectancy for vibration motor. Star Trace Pvt. Ltd. is a prominent manufacturer and supplier of Vibratory and Unbalanced electric motors used in various industrial applicationsfor vibration. Our Vibration motor are Robust, Reliable, High Loadable, Quiet Running consumes low electric current and require no maintenanceinspite of vibration. We export a wide galore of Vibrating or Vibratory equipments such as Vibratory motor, Vibrating Feeder & table, Gyratory Screen and so on.Our Vibro motor are totally enclosed 3Phase, Squirrel cage induction motors with adjustable, eccentric weights mounted at both ends of the shaft, to set up vibrations during rotation. The design of shaft and the selection of bearings has been carefully done to withstand heavy radial loads. Star Trace Unbalance Vibratory motors are light weight, strong vibration force, stable amplitude, adjustable force, wholly sealed machine shell, being able to work in any dusty environment used in electricity, building, food, coal, mining, light industry, chemical, cement, railway, port industry and so on for vibrating feeder, vibrating transportation, vibrating mine selection, vibrating sieve and the anti-blocking equipments of the silo, etc.